Beep. Beep. Beep. Beep. Beep. Beep. I clawed a hand free from the depths of my blankets and frantically slapped my nightstand, hoping to hit the offensive device that was pulling me from such a happy occasion. Once silenced, I desperately willed myself back to that mystical place I had just been. I rolled onto my side, pulled the covers up tight and begged my brain to turn back off and take me back to the adventure it had just been on. I wanted to be there and I needed to see what was next but alas, I was awake. What a delightful torment to start the day. And you better believe, I thought about that dream and that particular adventure ALL. DAY. LONG. Even with visions of that adventure playing like a movie through my brain, I managed to haul myself in a timely fashion to the office. The day was cold and grey in Indianapolis, which is pretty standard for this time of year, but surprisingly, I was still glad to be home. After being away from my desk for a day, I had many things to accomplish and I felt a bit of excitement to dive into my to-do list. I relished my normal cup of coffee while enjoying quick catch-ups with my coworkers and went about my normal day with a smile on my face. After a productive day of meetings and to-do list marking, I returned home at my normal time and warmed up some leftovers for dinner. I promptly cuddled up on the couch with my dog and an adult beverage and dove into my current Netflix binge. Bedtime came earlier than normal and I climbed into bed with the same kind of satisfaction that I had started the day with in dreamland. By all accounts, it was the vanilla-est of days. Yet even in the normalness of this standard day, I felt as happy as I did in the depths of the great adventure my brain had been on in the morning. By definition, wanderlust is a noun that describes the strong longing for or impulse toward wandering or travel. Additionally, conflicted, is an adjective that refers to experiencing conflict. Conflict in and of itself can be defined as being incompatible or at variance; a clash. So by definition, conflicted wanderlust = experiencing a clash against the strong longing to wander or travel. Wanting to be home and away. Here and everywhere. My dream versus my normal day. Does this ever happen to you? Does the excitement of a big adventure feel as comfortable as the routine of a regular old day? Are you as happy traveling to an exotic location as you are sitting, cuddled up on your couch? Do you yearn for the normalcy of your everyday life and to experience the routines of other cultures? Do you feel equal parts comfortable in the city as you do in the country? Is the white picket fence dream life as enticing to you as a life of exciting adventures? Do you ever wish you would’ve made a jump to a new location or career after school, after kids, even yesterday but also feel extremely grateful for being just where you are? Do you ever wish you could live twenty very different lives simultaneously? Yes, yes, yes and some more yes? Could I pour you a drink? This is the life of the conflicted wanderlust. I swear I was born to live 47 different lives. I’m talking legit, full, lovely, very, VERY different lives. The white picket fence dream life. Living as a nomad in foreign lands. On a boat. In a city high-rise. In the mountains. On the coast. An urban city dweller. A quiet, country life. In a VW van following a band around the country. Working to live at some resort that pays my room and board. Living to work as a corporate girl boss. The list is endless! Pretty much imagine any complete contradiction… and I’m totally in! I would and could happily plant myself any of these places and live a very full, happy life but would I always yearn for something else on the list? How can a person be equal parts homebody and adventurer? And for all that is good and holy- WHY DO WE NOT HAVE MORE TIME? Although this topic makes me a smidge panicky (I can feel myself starting to sweat!) this is my normal. I adore being a homebody but also start to twitch if I haven’t gotten on an airplane in too long. I love traveling more than almost anything but also love the routine of my standard, everyday life. I know myself pretty well and trust me when I say that this is not an identity crisis. This is simply me. A conflicted wanderlust. By definition. I consider myself a collector of people and experiences. I adore all things home and nurturing the relationships I already have. I’m also always looking for that new friend and itching for that next experience. Want to join me as I muse on all things conflicting? The more the merrier! 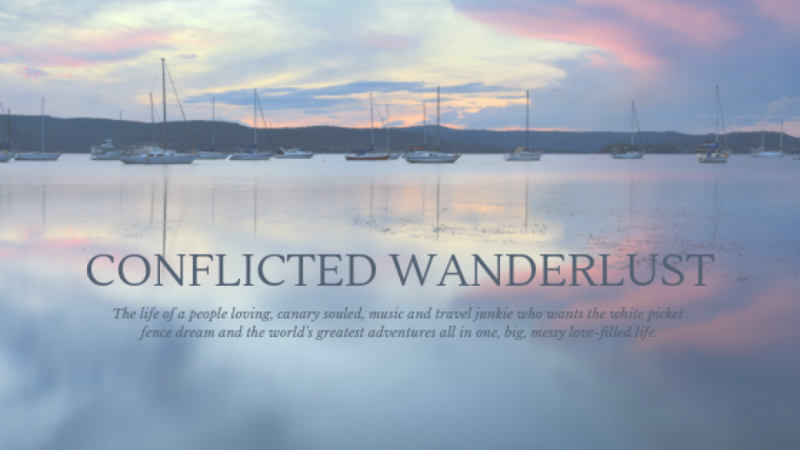 Join me and see what adventure is next for the conflicted wanderlust! It started as almost a whisper as I emerged from dreamland this morning and became more insistent as I clawed closer to wakefulness. Was I dreaming? Had I left the television on? Was there someone actually in my bedroom with me? (Thankfully, I realized quickly that the third wasn’t true- as I have a terrible habit of jumping out of bed in half-wakefulness and fighting off imaginary intruders. Literally. Yelling and throwing pillows at imaginary villains. Running through half the house before realizing I was dreaming. But alas- those are funny stories for another time.) I wasn’t dreaming… and there wasn’t an intruder… and I wasn’t actually hearing voices. Yet- I felt, as I have for the past few weeks, a nagging towards something. A certain unsettledness. I couldn’t quite put my finger on it. This time of year is always a time of unsettledness for me. Some years worse than others. I don’t know if it’s the finality of the end of summer? The promise of a new academic year? The coziness and joy of my favorite season? For some reason, the shift from summer to fall always affects great change in me. Sometimes I make major life changes. Sometimes I stumble through hard bouts of tough depression. Sometimes it’s a time of great adventure. Sometimes even, just a season of deep contemplation and organization. This year, I can already tell, is going to be a doozy. Not sure how it will manifest, but I can feel the storm brewing just under the surface. So today I woke with a stronger urge towards something. I don’t know if it’s my usual change of season shiftiness? The fifteenth anniversary of September 11th? The clean slate that came with the baptism of my newest nephew? The next step in a trying journey for my dearest friends? For some reason, today… TODAY, was different. I’m embarrassed to admit, that I’ve paid to host this domain for over five years now. It was one of my “30 in 30” bucket list items- to start blogging. The written word is a powerful force for me. Song lyrics. Beautiful poetry. Blogs. Great books. Magazine articles. Quotes. Those who have known me for a long time- know my love of these things. I’m the girl that had an overflowing quote book at age thirteen. Who pauses and rewinds television shows to catch a powerful narration on a scribbled piece of paper. Who can’t share books with others for fear of judgment over just how much is underlined, highlighted and dog eared. Who examines and learns song lyrics anytime I dive into a new album of a favorite artist. Who loves to receive a written letter more than just about anything in the whole world. Who has piles of half-filled notebooks containing random journal entry-like thoughts. Who cherishes and savors any beautiful expression of love in word format, whether a card, a thoughtful text or an inspiring email, forever. For some reason, words have always resonated with me. And after a career stop that allowed me just a taste of writing alongside my event planning- I’ve been thirsting to write ever since. I’m not a particularly smart person and consider myself solidly in the average intelligence bracket. I know that my grammar and punctuation don’t follow APA style guides. And what does little old me have to say that is so important it would dictate others follow? My average life surely doesn’t offer any type of entertainment (unless I’m recounting stories of fending off imaginary intruders- because that, CLEARLY, is VERY entertaining!) I am not a writer by trade, so what gives me the right? I toyed with topics, ideas, a niche I thought people would enjoy. My dating life (I COULD write a book)? Travel adventures? Positive stories of change happening in the world? Concert reviews? My klutzy journey as a homeowner? Escapades with a new puppy? I even toyed with just blogging to blog and not sharing it with anyone. But the written word is so moving to me because it stirs something or produces a dialog or inspires something. So why not me and why not now? Who really cares if anyone reads? What if someone actually does? And for that two minutes- I can inspire change? Make someone laugh? Even take someone away from the tediousness of life for a few moments? And what if it fills my bucket and makes my soul happy? Aren’t any of those alone reason enough? As a young person- you hear time and time again… “Enjoy it! It goes by so fast!” “Make the most of this! Before you know it, it will be over.” “Time goes faster and faster the older you get!” I always believed people when they told me that. Truly! My belief ran so deep, that I often found myself stressed that I wasn’t making the most of every moment. That I wasn’t taking enough from each experience. Too many people say these things, for them not to be true. But I don’t think I ever truly understood the power of those words until this year. 2016 has been a shifty time warp of a year full of the bitter and the sweet, as life so often is. I swear I’m still catching my breath from February and suddenly it’s the middle of September. Time continues to march on more quickly than I would like and suddenly life seems so, so short. And what, truly, is there to be a afraid of, other than that? So now. I’m starting now.